Thermometers in Spain started rising on Tuesday as the country geared up for the second heat-wave of the year, with temperatures expected to climb up to a scorching 44 degrees Celsius (111 Fahrenheit) in certain areas over the next few days. More than half the country is to be under an orange alert (the second-highest) for extreme temperatures starting Wednesday and two southern provinces, Cordoba and Jaen, are to be under the maximum red alert, meaning the heat is expected to reach dangerously high levels. "The Guadalquivir River valley and the southern half of Extremadura and Castilla-La Mancha will be severely affected by this situation during at least Wednesday, Thursday and Friday, with temperatures exceeding 40 degrees Celsius and likely reaching 44 degrees in the provinces of Jaen, Cordoba and Granada," the state meteorological agency Aeme said in a statement. The spokeswoman for Aemet, Delia Gutierrez, told EFE that the worst day was expected to be Thursday but the sweltering heat was expected to last throughout the weekend in much of the country. Gutierrez said the blistering weather was the result of a mass of air from northern Africa that, combined with clear skies and the intense summer sun, was to make the mercury skyrocket. The northern coast, which borders the Atlantic and has a cooler clime, was expected to avoid the temperature hike that the rest of the country is to be subjected to, with maximum predictions reaching 22 degrees. 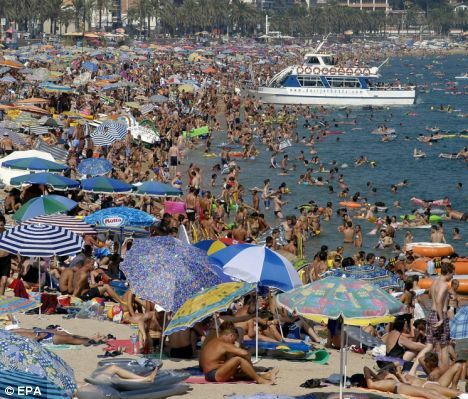 Holiday-goers planning to avoid the heat by hiding along the Mediterranean coast - which is sure to be packed - will be sorely disappointed, as most of the littoral is expected to be hit with up to 41 degrees. The only escape from the warmth will be the night, as once the sun sets temperatures are expected to cool to 20-25 degrees, though visitors accustomed to colder conditions may not see this as cause for relief. Despite heavy rains across the Peninsula over the last week that caused chaos in Madrid after metro stations were turned into indoor water parks, Spain's hydraulic reserves continued dropping, currently standing at just over 51 percent of their capacity. According to the agriculture, fishing, food and environment ministry, last week's downpours in total represented 1.1 percent of the country's reservoirs. Civil protection services warned that the dryness and intense heat increased the risk of wildfires, meaning extra precautions should be taken to avoid starting a devastating blaze.